Let me say this right off the top, Lifetime Warranty. And secondly, 18/10 stainless steel that will never rust . This setting for eight consists of 8 Dinner Forks, 8 Teaspoons, 8 Knives, 8 Salad Forks and 8 Tablespoons. A very classic, solid design for a great price. 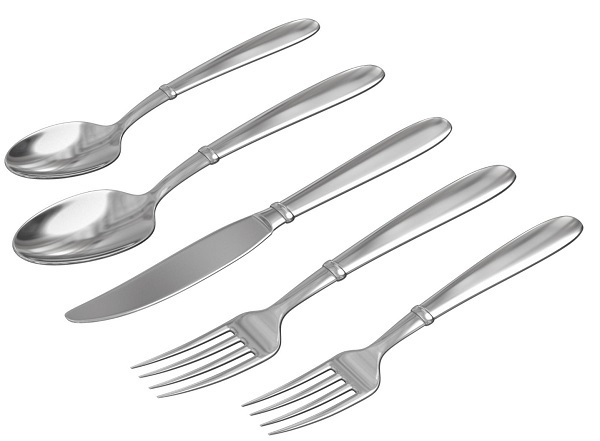 • Do not wrap your flatware in rubber bands, plastic or newspaper, or in any material with a high sulfur content. People, please read and follow these rules and avoid a disappoint. In our house we never use the dry cycle in the dishwasher, it’s too hard on everything. Just open the door and let it dry naturally from the residual heat of the hot water. With a good rinse agent you won’t get spots, trust me.